WINNER OF THE WATERSTONES CHILDREN'S BOOK PRIZE 2018 YOUNGER FICTION CATEGORYWINNER OF RED MAGAZINE'S BIG BOOK 'BEST CHILDREN'S BOOK (7-12)' AWARD International bestselling new series. 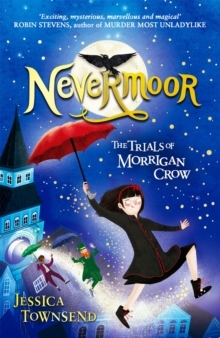 Enter the Wundrous world of Morrigan Crow and Nevermoor - the most fantastical children's series of the year. "Exciting, mysterious, marvellous and magical ... quite simply one of the best children's books I've read in years" - Robin Stevens, author of Murder Most Unladylike"An extraordinary story full of magics great and small" - Kiran Millwood Hargrave, author of The Girl of Ink and Stars"Endlessly inventive, with a fresh delight on every page. Nevermoor rewrites the genre of the Chosen Child novel. This is a special book" - David Solomons, author of My Brother is a Superhero"A full-speed joy of a book; funny, quick-footed, and wildly, magically inventive" - Katherine Rundell, author of Rooftoppers"A wonderful, warm-hearted magical adventure" - Sunday Express"Funny and delightful" - The Sunday TimesMorrigan Crow is cursed, destined to die on her eleventh birthday. But, as the clock strikes midnight, she's whisked away by a remarkable man called Jupiter North and taken to the secret city of Nevermoor. There she's invited to join the Wundrous Society. Mystery, magic and protection are hers - if only she can pass four impossible trials, using an exceptional talent. Which she doesn't have... Perfect for fans of the Harry Potter series and His Dark Materials, this series takes readers into an extraordinary world, setting hope and imagination alive.